Abbot Kinney First Fridays aka @AbbotKinney1st rang in the New Year with Tasty Eats on Abbot Kinney Boulevard in Venice, Our Fave Place on the Planet! From cupcakes to churros, cheese, rice balls and even asparagus (with cheese of course) it was a culinary delight for all the First Fridays in Venice Peeps! This is a sampling of the eats on offer at First Fridays. Gotta pic you want to share on our website or social media? Reply at the bottom of this post or share on our Facebook Page. Let us know what truck it’s from, what you ate and your name. Desserts reigned supreme and this double header of ice cream sandwiches looked absolutely delish! Cupcakes, lotsa cupcakes also were a big hit from the Cupcake Truck – wow look at the selection! Knowing how much First Fridays Peeps live, oops we mean LOVE, food trucks, you may be interested on getting some sweet specials all year long, wherever the trucks are located, NOT just First Fridays. How is this possible? Our AKFF VIP Club makes it possible with a 1 year Membership! What else does the AKFF VIP Club Membership get you? 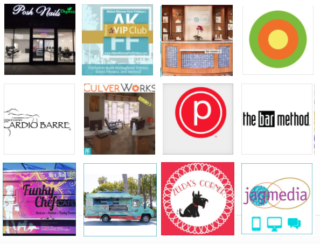 Specials on coworking, beauty – think spas, fitness brick and mortar shops and cafes plus health and wellness. Click Here & See our Fab Specials & even get a New Year’s Special on a 1 year Membership! Let’s get back to food, cause you gotta eat, right? Rice Balls of Fire was one of 20+ food trucks on Abbot Kinney on January 5, 2018. AKFF, that’s us, recommends getting there as early as possible to find parking and get settled in. BTW, did you know our AKFF VIP Club Members get the scoop on Secret & FREE parking for First Fridays? Yeah, Members get the scoop so make sure to join and get the deets before the next 1st Fridays! Want to find out the dates of all Abbot Kinney First Fridays in 2018? Of course you do! See our First Fridays calendar here.